You can’t always control the challenges you face, but thanks to a team dedicated to advancing women’s health, at Aurora BayCare, you do have expanded options for your medical care. Women’s health care is a priority at Aurora BayCare Medical Center, where we lead the way in raising the standard. We are an AAGL Center of Excellence in Minimally Invasive Gynecology™. For our patients, minimally invasive surgeries provide a lower risk of complications, less pain, and faster recovery times. Surgeries that used to require six weeks of recovery can now be done with just a few “Band-Aid” size incisions. You can return to work in just one or two weeks! With minimally invasive surgery, you have more options for gynecological issues such as ovarian cysts and infertility, incontinence, fibroids, gynecological cancer, and heavy and abnormal bleeding. 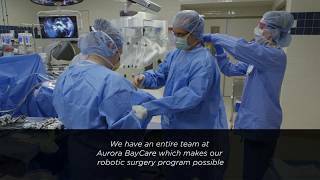 More than 20 minimally invasive procedures are offered by more than 16 doctors Aurora BayCare Medical Center and its clinics. Minimally invasive surgery offers you the benefits of incision-less procedures, or, smaller incisions and fewer stitches, shorter hospital stays and quicker recovery, less bleeding, less discomfort, and reduced risk of infection. Minimally invasive procedures can also be used to provide permanent birth control options. One in three women will undergo a hysterectomy at some point in their lifetime. The most common surgical procedure prescribed for women, over 70% of hysterectomies performed at Aurora BayCare utilize laparoscopic or robotic procedures. That’s more than double the national average. Minimally invasive hysterectomies make it possible for you to have your procedure and go home the same day. Many patients tell us they would prefer to recover at home where they feel most comfortable. Minimally invasive surgery makes that a safe, viable option for many women. Learn more about our women's health providers. 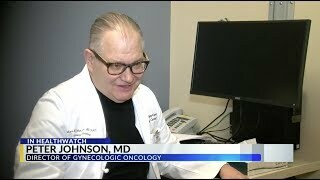 Consult with a gynecologist at the Aurora BayCare Women’s Center to find out if minimally invasive gynecological surgery may be right for you.